This recipe for Southern-style summer squash casserole is perfect for the abundance of zucchini and yellow squash you find at summer farmer's markets and in your own home garden. Summer squash and zucchini are some the easiest vegetables to grow if you want a crop that should be foolproof. Once your ​garden is going, you'll understand why you need recipes for what to do with all of the summer squash it produces. This casserole makes an excellent side dish or vegetarian main course. A casserole is always welcome at a potluck and it is easy for your guests to spoon out and serve themselves. Now that out-of-season produce is available year-round from some part of the world, this would make a terrific accompaniment for a holiday meal like Thanksgiving, Christmas, or even Easter. It can also be adapted to use winter squash or to make in a slow cooker. Cook the sliced squash and chopped onion in boiling salt water for 5 to 10 minutes. Drain well. In a large bowl, combine the soup and sour cream. Stir in the shredded carrot and mix thoroughly. Fold in the well-drained squash and onion. In a microwave-safe bowl, melt the butter, remove from microwave, and toss with the stuffing mix. Spread half of the stuffing in a 12-by-8-by-2-inch baking dish (about 1 1/2- to 2-quart size). Spoon vegetable mixture on top. Sprinkle with remaining stuffing mixture. Bake at 350 F until heated through, about 25 to 30 minutes. Remove it from the oven and serve the casserole hot. 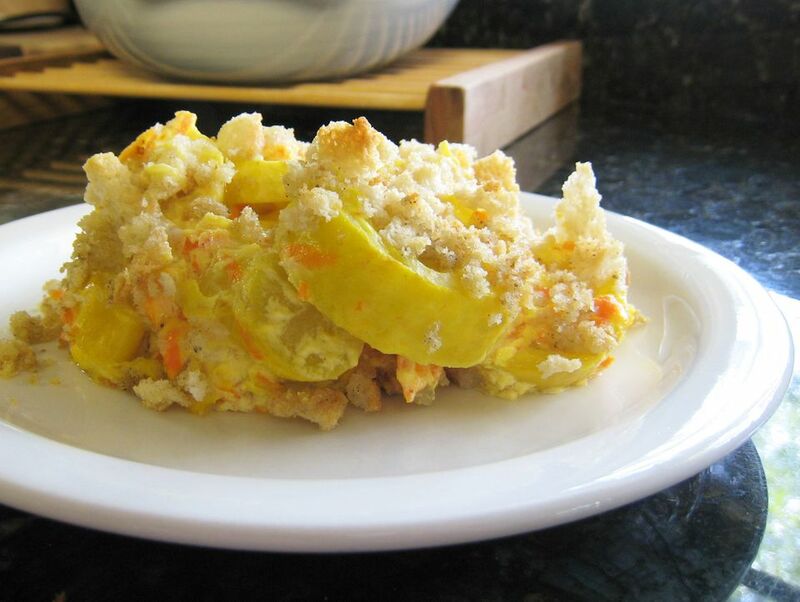 Substitute large florets of cauliflower for the squash or combine it with the squash. Winter squash can be substituted, such as butternut squash. Use small cubes of peeled butternut squash in place of zucchini and yellow squash or in combination with them. Add four strips of cooked and crumbled bacon to the vegetable mixture. Stir in 1 cup shredded cheddar cheese with the vegetable mixture. Mix in 1/2 cup sautéed chopped red bell pepper for color. Adding in all three of these options (bacon, cheese, and red bell pepper) would make it super deluxe.